As elegant, gentle and graceful as Mrs. Rose itself taste also the ESE pads. 100% Arabic beans provide a fine, balanced flavor. Coffee - a word that brings back memories of places and people. Just hearing the word calls to mind images of a whole world, awhole culture, as well as evoking flavour, history, care and dedication. The culture is that of the coffee plantations that lie between the two tropics; the flavour is that rich, intense taste, reminiscent of so many coffee breaks or social encounters; history is the images coffee evokes of bourgeois salons and coffee houses, literary circles and democracy; finally, care and dedication refer Brao’s twenty-five-year-strong commitment toguaranteeing its customers a product of truly outstanding quality. From his own recipe, he created the BraoOro and BraoArgento brands of coffee in 1987. A year later, Oddene's search for a coffee of the highest quality, which had a distinctive personality, led him to create Mrs. Rose. (Brao Website) Mrs. Rose is an incredibly pure blend of coffee that is perfect for the most discerning palates. Made of 100% arabica coffee, Mrs. Rose is a guarantee of exceptional qualityand unadulterated flavour. What's more, with its low caffeine content, you can enjoy Mrs. Rose when you wish. All Mrs. Rose products are made up of a unique blend of six different types of arabica coffee. Mrs. Rose is an incredibly pure blend of coffee that is perfect for the most discerning palates. 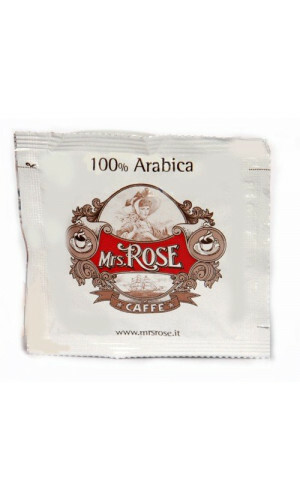 Made of 100% arabica coffee, Mrs. Rose is a guarante. A high-qualitybrand, guaranteeing, quite simply,excellent coffee which you can enjoy now as easy to serve Mrs. Rose ESE Pods.